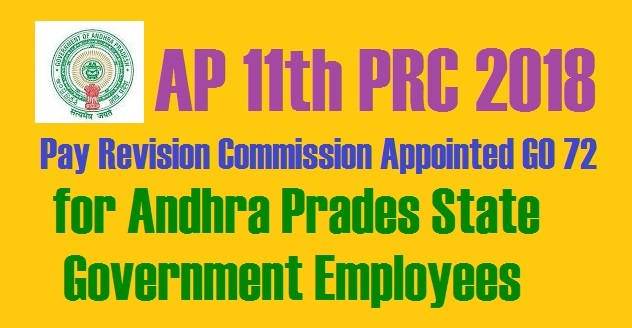 AP 11th PRC 2018 Pay Revision Commission Appointed GO 72 for Andhra Prades State Government Employees G.O.Ms.No.72 . Dated:18.5.2018. AP Sarkar appointed the 11th PRC committee with three members in Andhra pradesh. This committee will study the various issues of salary along with the salary revision and submit a report to the government. 1. The Pay Scales of the State Government employees were revised with effect from 01.07.2013 with monetary benefit from 02.06.2014. APJAC of Employees, Teachers, Workers and retired employees Associations (AP JAC Amaravati) have represented for constitution of another Pay Revision Commission for the State Government employees. Government has considered the representations and after careful consideration, has decided to constitute the 11th Pay Revision Commission for the State Government employees.